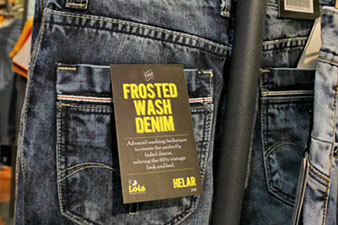 Naming the collection as the Frosted wash denim, an easy name to remember and reflecting the washing method of the denim. 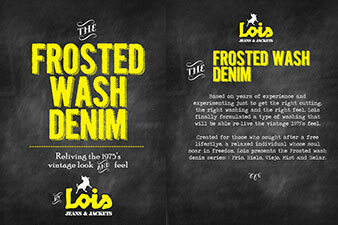 As for the each product under the Frosted wash collections, the naming were using simple Spanish, such as : FRIO (menas cold), HIELO (means ics), to come back to Lois heritage as a Spanish Jeans that goes global. Design including product logo, tag and brand image. 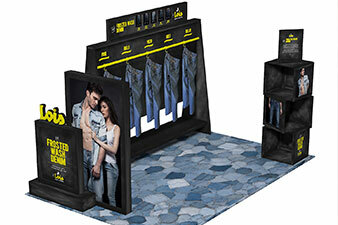 The overall look is to present denim on black background, with white washed effect. This dark background is made so the focus is mainly on the denim while the “washed effect” background is also telling story about the way the denim was developed (through cold washing process). Energised the sales force by rebranding staff clothing ware and transportation vehicles, developing new sales folders and showroom signage, plus providing design advice on showroom repositioning and exhibition booths.